Open spaces, soft lines, flowing curves. These concepts inspire many of my designs. I have worked with several different styles, but nothing fulfills me as much as the abstract. I love the freedom I have to express whatever ideas interest me. A good example of this is Abstract Circles. The concept came from the need to make a design that gives the feeling of open space in a 12-square window, but altogether makes one design. We wanted the viewer to see one window, not twelve small panels. I needed to design something modern and opaque, according to the style of the room and the need for privacy. With Glass Eye 2000 I am able to draw over an image, so I took some photographs of the room and started to design. But then the project was cancelled, but because I liked the design I posted it on my website. Shortly after, a customer visited me in my workshop and said that after seeing hundreds of windows on the Internet, he liked nothing so much as that design. My client has a very sunny penthouse. When you open the front door, the first thing you see is light passing through a large window measuring 2.30 x 1.30 meters (90.55" x 51.18"), the perfect place for a stained glass panel! It was then necessary to adapt my original design to the new size and shape to fit my customer's window frame. For its large dimensions I inserted the stained glass panel inside double glazing, but this also represented a challenge, because the final piece weighed 110 kg (242 lb). The accuracy, quality and originality in design are the hallmark of my studio, and with Glass Eye 2000 I can create geometrically precise designs. An abstract design isn't merely a collection of haphazard lines as some may think. A good design requires order and flow, and with this software I'm able to make panels that meet our high quality standards and, of course, fulfill the expectations of our customers. As soon as this client made his color selection, we began our work. Would you like to see how the panel was made step by step in just two minutes? We created a video of the process! Jonathan Diaz was born in southern Spain, where he currently lives and works. In 1997, at age 14, he began working with stained glass. After his first little panel he knew he had found his life's work. He soon began doing work for friends, and saved his money to start a small workshop. 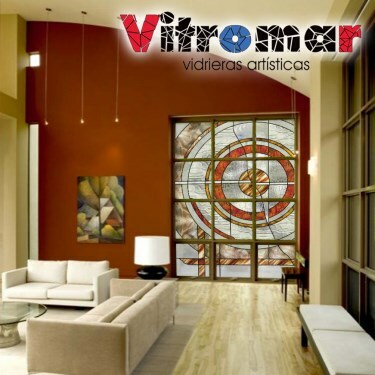 Today he is still running his own company, Vitromar, which is known for doing projects for renowned architects and interior designers. 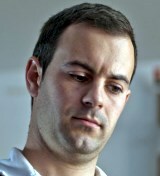 His works have been installed in Spain, France, Germany, Poland and Russia among other countries. He specializes in abstract design, but many customers call upon him to design neoclassical works for luxury villas. Jonatan has more designs at his website and on Facebook, and you may contact him by email.